God willing to make a pilgrimage to the islands of Mull and Iona between August 2 and August 9. The pilgrimage will be led by the chairman of FOI, HE Metropolitan Kallistos of Diokleia, with Father John Musther from Cumbria acting as chaplain. Iona is a tiny island of exceptional beauty where Saint Columba founded a famous monastery - one of the most important Christian centres in western Europe - in the mid-sixth century. The pilgrimage will follow a pattern that has worked well on two previous occasions. We hope to celebrate the Divine Liturgy on Iona on August 3 and again on August 6, the (new-calendar) feast of the Transfiguration. We expect that most pilgrims will stay in Fionnphort - across the strait from Iona. The Creich community hall in Fionnphort will be at our disposal for simple acts of worship, dormitory accommodation and basic evening meals. 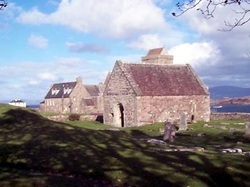 However most pilgrimage activities (walks, talks, guided reflection) will take place during the day on Iona, within the hours that ferry timetables allow - ie between about 9 am and 6 pm. All pilgrims will have the chance, weather permitting, to go on boat trips to places like Staffa, Fingal's Cave, Inchkenneth and the Treshnish Islands.